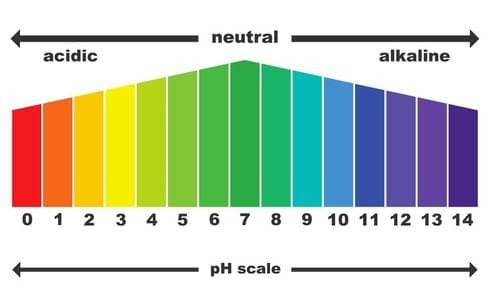 pH balance is incredibly important because it’s very hard for things to go “wrong” in your body if the balance between alkaline and acidic is dialed in on the sweet spot. For humans, the optimal pH level is 7.365. That’s just a notch to the right of the seven you see below. On the pH scale above (you may remember it from chemistry class), anything from 1-7 is known as an acid. The lower the number on the pH scale, the more acidic something is. And the more acidic something is, the more dangerous it may be. Think about how battery acid eats away at human flesh and you’ll understand what I mean by dangerous. However, just because an acid is potentially dangerous doesn’t mean that it’s not useful. For instance, the hydrochloric acid found in your stomach has a pH of 2. That’s a good thing, because if it was less acidic your body couldn’t break down food and digest it properly. As the numbers on the scale begin to climb past seven, things become more alkaline. Too much alkalinity in the body also poses a problem. For instance, strong alkalinity results in the formation of strong chemicals like ammonia, which aren’t necessarily beneficial for human health in large amounts. When it comes to your body, you want to be neutral, or just above neutral. For a human body that proper ph balance is right around 7.365. Most of you reading this will never need to worry about becoming too alkaline, simply because your diet, as well as a list of environmental factors, promote acid forming inside the body. pH ADJUST may be used to increase salivary and urinary pH; counteract overly acidic conditions in the digestive tract, blood, and kidneys; and to supplement the body with the minerals potassium, magnesium, and sodium. The product contains (in powder form) potassium bicarbonate, magnesium carbonate, potassium glycinate, and sodium bicarbonate. TESTING pH LEVELS: The best way to test pH levels is to use litmus paper, which HPDI offers in rolls (Hydrion brand) for this purpose. You can test both salivary and urinary pH. Advantages of pH paper include rapid results, ease of use, and cost effectiveness. The color of the litmus paper indicates the pH level. Most litmus paper comes with an indicator chart showing colors corresponding to various pH levels. Alkaline states will generally produce a dark green, blue or purple color (most basic). Acidic states will range from yellow (most acidic) to light green. It is best to test your pH in the morning before consuming foods or drinks. Salivary and urinary pH are affected by recent food consumption, so re-test several hours after eating, and additionally throughout the day.